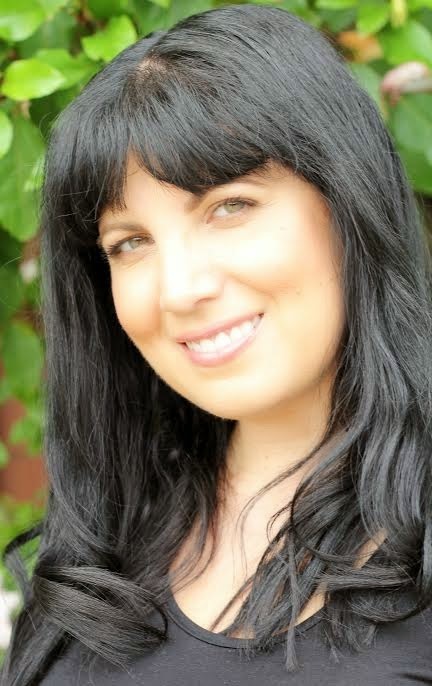 We're pleased to introduce Tess Woods, who is visiting Chick Lit Central from Perth, Australia, where she lives with her husband, two children, dog, and a cat who rules over all of them. She's here to talk about her debut novel, Love at First Flight. When she isn't writing, working as a health professional, or being a personal assistant to her kids, Tess enjoys reading and all kinds of granny-ish pleasures like knitting, baking, drinking tea, watching Downton Abbey, and tending to the veggie patch. You can find her at her website and on Facebook. A family is threatened by an irresistible attraction in this compelling debut that will appeal to fans of Liane Moriarty and Anita Shreve. "Looking back on it now, I can see it was instant. The second we locked eyes. Boom. Just like that. The me I had spent a lifetime perfecting began its disintegration from that moment. And despite the carnage it brought to all our lives, I still don’t regret it." It was long and windy with speed humps and detours. 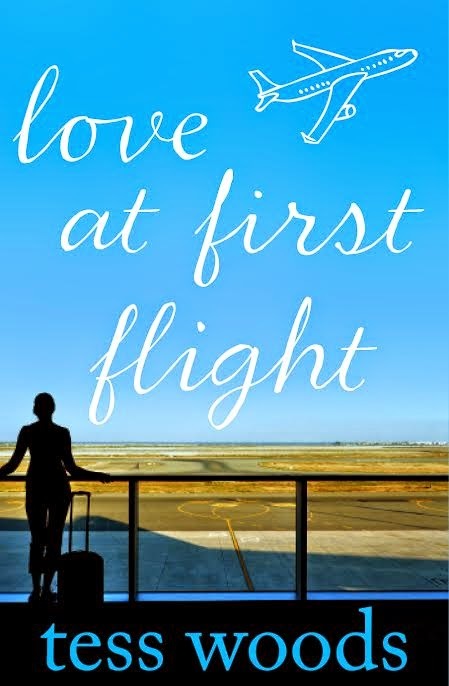 What is something you learned from writing Love at First Flight? I learned that it takes a village to write a book. It’s a team effort between author, literary agent, editor, publisher, friends who are your first readers and family to care for you. Writing is a lonely business but you need lots of support at the same time. If you could cast actors as the lead characters in Love at First Flight, who would you choose? Hugh Jackman as Adam, Rose Byrne as Mel and Orlando Bloom as Matt. What a dream combo they would be onscreen! I would love to cast my daughter, Lara, as Mel’s daughter Lily because the character is based on her. What is your favorite item that you knitted? My favourite things to knit are for my daughter to play with. 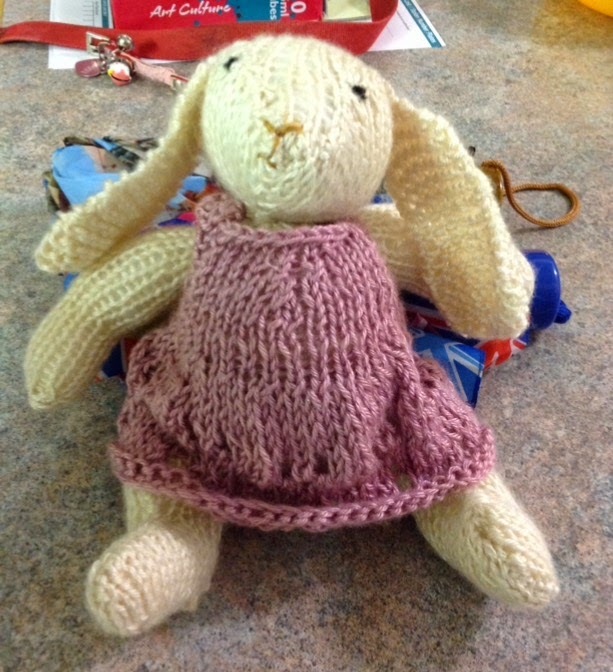 I’ve knitted plenty of outfits for her Cabbage Patch and Barbie dolls and I especially love this little bunny I knitted for her. What is the theme song for Love at First Flight? Tell us something funny or memorable that happened to you during a flight. On the flight home from our honeymoon, I had been feeling sick in the tummy and I went into the plane toilet to see if that would help ease the tummy pain. I was in there for a while and getting quite embarrassed but when I finally came out, I felt so much better. I quickly went back to my seat on the plane and flopped down, telling my husband, as I sat, that I felt “so much better after doing a massive poo.” Turns out I wasn’t paying attention and had flopped down into the wrong seat and had just confessed that “massive poo” to another man, a complete stranger! Thanks to Tess for visiting with us and sharing her debut novel with our readers. Open worldwide. Giveaway ends April 14th at midnight EST. My story isn't embarrassing, but weird and sweet. When I went to Hawaii with my ex for the first time we went stand-by (using one of my sister's family passes, she worked for AA) and couldn't sit together on the trip home. I had a teenage boy sit next to me. He was a nice kid and we talked a lot. Then, I fell asleep and when I woke up, he had fallen asleep with his head on my shoulder. I didn't quite know how to react, so I just pretended to be asleep longer until he woke up so he wouldn't feel embarrassed if he knew I found him like that. I was on a flight going from Shanghai to Hong Kong and the moment the plane was taking off at high speed (the seat belt sign still lit up, the plane at quite an angle as it was ascending in the air) one of the old Chinese ladies sitting in the row next to mine, decided to stand up (turns out she needed to go to the loo). Obviously she struggled cause of the pressure and she landed face first in the lap of the person sitting next her. I know my grandmother once took a tranquilizer on a plane and they had to get a wheelchair for her to get off the plane because she was too sleepy to walk out, lol. I wasn't there but I heard the story from my aunt. Oh - I love that poo confession story! good luck with the book Tess. Travelling with small children in a confined space is always **fun**. Unfortunately they were mine & I could not just try to ignore them. The Terminal. It was hilarious. I can't remember the name of the movie, but Harrison Ford was the president and his plane was hijacked. The movie She's Out of my League - Max (Jay Baruchel) works as an airport security checkpoint guard. His characters name was Kirk, not Max! Sorry! I love Planes fire and rescue! My grand kids favorite movie! SLeepless in Seattle when they do the map thing to show how far they are going...kinda a plane thing! Love the flight story about sitting down next to the wrong person and then announcing what just happened. Sooooo funny!